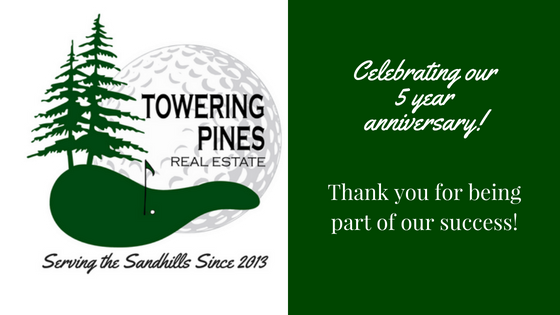 Towering Pines Celebrates 5 Year Anniversary! On May 1, 2013, Terry and Allen opened the door, both literally and figuratively, to a new chapter in their lives when they began doing business as Towering Pines Real Estate, here in Southern Pines. In those 5 years, they have grown their independent, start-up brokerage to 18 professionals and one amazing administrator; they have established their company as one of the most respected firms in the markets we serve; and, oh yes, they got married! Over the next few months, we will be celebrating our 5-year anniversary in a variety of ways. We want to thank the many clients who have placed their trust with us in allowing us to help them buy or sell real estate, as well as the support we have received from our affiliated service providers – the lenders, attorneys, inspectors and contractors, as well as our Realtor® referral partners, all of whom have helped us establish a standard of client service that is second to none. Whichever role you have played in our success, we appreciate you, and look forward to serving you for many more years to come! Congratulations on your 5 years of success in Real Estate in Pinehust. Wishing you continued success. © 2019 Fayetteville Association of Realtors. All rights reserved. Information deemed to be reliable but not guaranteed. The data relating to real estate for sale on this website comes from Fayetteville Association of Realtors and the Broker Reciprocity Program.sm information is being provided is for consumers\' personal, non-commercial use and may not be used for any purpose other than to identify prospective properties consumers may be interested in purchasing. Real estate listings held by brokerage firms other than Towering Pines Real Estate are marked with the BR logo and detailed information about them includes the name of the listing brokers, all listings are provided courtesy Fayetteville Association of Realtors . Listing broker has attempted to offer accurate data, but buyers are advised to confirm all items. Information last updated on 2019-04-25.